Life on the race course changes significantly when you take the step up from sailing practice or sailing locally to a 50-plus-boat regatta. Here are some tips from Quantum’s Karl Felger to help you shine at your next big event. 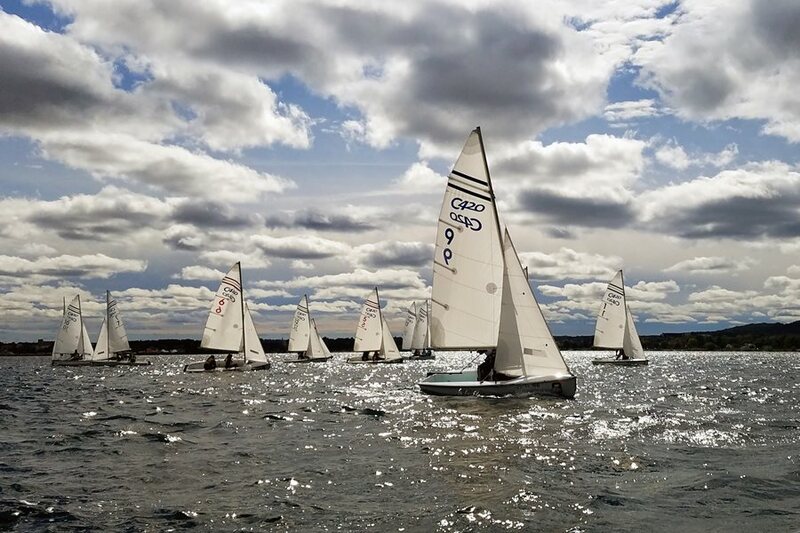 Clean air is good for more than just breathing - A high school sailor breaks away from the pack to sail in clean air at a regatta on the Grand Traverse Bay in Michigan. Sailing at practice or in a small 10-boat fleet provides an opportunity to find some space, get some leverage, and get back in the game. Sailing in a large fleet amplifies mistakes and minimizes opportunities, so it’s important to avoid some of these high-risk, low-probability moves on the race course. In small fleets, waiting for a hole to appear on the starting line may be your best move, but in a large fleet those holes are few and far between. If you’re sailing down the starting line on starboard and unable to gybe back due to a long line of port tackers, head upwind a few boat lengths and either gybe or tack back to port to find your hole on the starting line. If Happy Gilmore taught us anything, it’s that it’s important to identify a hole early and fight for it…almost any hole on the starting line in a large fleet is a good hole. One of the fundamental rules in sailing is a boat on starboard has rights against a boat on port. In a small fleet, it's important to execute these rights whenever possible to keep as many boats “in your pocket” (or stay ahead) as possible because it’s easy to stay in control. In large fleets, opportunities to control the fleet are few and far between, and sometimes it's more important to keep working to the left side of the racecourse. If you exercise your starboard rights too often, you may risk someone plant a perfect lee bow on you that you’re forced to tack onto a head, sailing away from the side of the racecourse you wanted to. If you want to keep going left, wave the port tacker across, duck their transom and continue on your way. According to Patches O'Houlihan, more often than not, you’ll cross them later in the beat and all will be right in the world. Approaching the weather mark on the port lay line can sometimes be your judgement day, especially if someone tacks right on your nose. While it might be tempting to say “See ya later, layline,” three tacks in a short period of time could spell your termination. In a large fleet and close to the lay line, it’s sometimes better to live in the bad air or foot through it until you get to the starboard lay line. As we learned from Skynet, sometimes it’s better to accept your fate on the port lay line and live to fight another day. In a large fleet, the stack-up at the starboard lay line can be daunting. Tacking underneath a large pack of boats on the lay line and hoping for a perfect puff to make the mark is not a good strategy. It normally leads to missing the mark or, worse, hitting the mark or another boat. As Van Wilder taught us, a better approach is to duck the boats on the lay line and tack back to a spot where you are slightly overstood and avoid any issues at the mark. Keeping in touch with your competition by gybing with them early on the run may seem like a sound tactic, but it’s important to look behind you and see if gybing makes sense in the big picture. If your competition gybes, ask yourself if it makes sense to follow by factoring in whether there will be clear air and/or more breeze when you gybe. If not, do as Elsa does, and let them go! After rounding the weather mark, it’s important to take the best angle to the next mark. However, if everyone else around you is sailing hotter angles, it’s important to work on matching their speed before sailing a good angle to the next mark, especially if the water is flat and the waves are not surfable. Staying high with clean air keeps you in the advantage and moving fast while other teams make mistakes. As Maverick and Goose like to remind us, put the bow up, kick the tires, and light the fires.